The 2017 vintage is one that will be remembered for its extremes. A short growing season was capped with intense heat, resulting in a quick and compact harvest that kept our tanks full. The winter brought much needed rain to Sonoma County, with near weekly potent storms. It was wet everywhere, and the Estate vineyard received above average rainfall. A deep cold front in spring delayed bloom and fruit set, a reversal from the earlier bud break from the past several years. Once the sun returned, warm weather persisted throughout the entire growing season. With the topsoil charged with enough moisture from the wet winter, the vines grew at breakneck speed with intense dark green foliage. June kicked off a summer of record heat, with temperatures in the low-100’s throughout Sonoma County, including the normally cool Russian River Valley. The vines responded with dramatic shoot and rapid canopy growth. The warm weather continued with back-to-back heat spells that kickstarted harvest in dramatic fashion. On Aug 29th we brought in fruit from the Hallberg ranch and our Estate. The following day we picked in all of Laguna and Alberigi, plus some of both Savoy and Estate Pinot Noir. Due to the persistent heat, we scheduled our picks in the very early mornings to avoid any desiccation and retain natural acidity in the fruit. It definitely was a year for the record books. Harvest was relentless and it was non-stop and exhausting. Luckily, we never ran out of tank space, although they were always full. We finished picking the last fruit, Dusty Lane Syrah on Saturday, October 7th. The following evening, October 8th, brought the last extreme of the 2017 vintage, with the outbreak of multiple Wine Country wildfires – some of the most destructive in California recorded history. We were very fortunate we were not in their direct paths, and the fruit was safely in the cellar, but it was a significant event that ultimately shaped the vintage in our memory. The rainfall California received in early 2016 was a welcome return back to normalcy following years of historic drought conditions. The mild summer gave the grapes slightly longer time on the vine and allowed us to pick the fruit at optimal physiological maturity. Yields increased from 2015, while the quality remained high and the wines are showing an exuberant personality. After the 2015 harvest, the 2016 winter forecast was for a record El Niño year. By the end of December we had already received nearly 18 inches of rain at the Estate vineyard above Occidental. The soil remained saturated and local flooding became an issue as each storm brought with it several inches of rain. Yet the ominous forecasts of torrential rainfall didn’t last long, and Sonoma County ended up with a perfectly average amount of rainfall. Still, that average rainfall was a relief from the past four years of unseasonably dry winters. The warm spring allowed for an early bud break at most of our West County sites. As early as the end of February and beginning of March, tender green leaves were slowly emerging from their winter dormancy. The warm conditions continued, and we skirted a frost-free spring. After a successful bloom came some light rains in May, yet sun-filled mornings led to healthy canopy growth. Managing this growth was a persistent exercise as we headed into the warmer summer months. Dramatic cooling happened during the middle of August, and the nights got chilly and the morning fog returned. We embraced some hang time, with complex flavor development unaccompanied by higher sugars. We began harvesting Pinot Noir on August 20th with Hallberg in Sebastopol and Savoy vineyard up in Philo, and Alberigi and Laguna were right behind. We harvested our inaugural Pinot from the Estate vineyard on the 2nd and 3rd days of September. In a swift start to harvest, all the Pinot was picked by September 8th. Chardonnay came in immediately after most of the Pinot Noir, and the Syrah and Zinfandel were in by the last week of September. The 2016 growing season was nearly ideal. The weather was favorable during harvest, and we picked all our fruit before the first rains in early October. Yields were back to average after 2015’s reduced crop, and the overall quality of the fruit has been very exciting. There’s an inherent energy to the wines that’s reminiscent of the concentrated 2015 vintage, yet with a more feminine spirit. There’s a natural balance to these wines that make them approachable in their youth, with an elegant tannin profile and vibrant acidity that offer excellent cellaring potential. California was in its fourth consecutive year of drought, the Sierra snowpack had dwindled to 8% of average, and mandatory water restrictions were in effect for many residents. Yet despite these alarming conditions, the 2015 vintage may well be one worth cellaring. A warm winter, dry soil conditions and a long, cool spring ultimately defined the vintage with an exceptionally early harvest and light yields. 2014 ended with a significantly warm December, combined with several back-to-back stormfronts. Here in the Russian River we received nearly 15” of rain in December alone. Though we did not receive any significant rainfall again until February, the lack of water in our local Goldridge soils and warm winter temperatures worked together to force an early spring. Budbreak at our Sonoma Coast and Russian River vineyard sites began three weeks ahead of 2014. 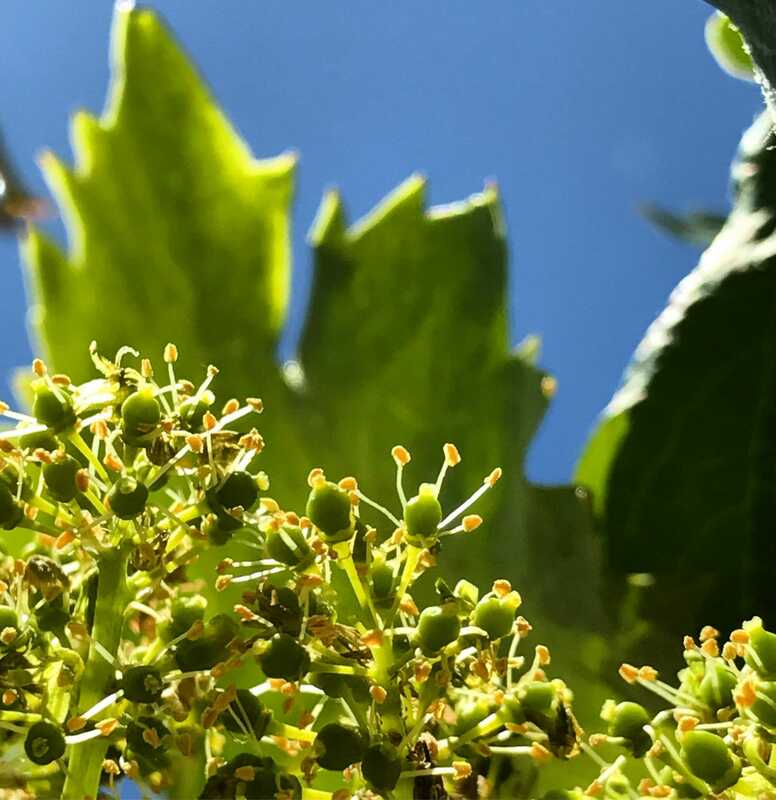 The month of May brought dramatic cooling, and these early bloom cold temps kept the flowers of many of the grapes closed, unable to self-pollinate, potentially creating a phenomena known as “shatter” and ultimately an overall reduction in final grape yields. Despite the significant spring cool-off, the seasonal drying trend continued through early summer, accelerating bloom and shoot growth ahead of schedule. We witnessed veraison the first week of July at the Hallberg Ranch and Alberigi vineyard. As the berries grew and then began to change color we soon realized that most of our vineyards, across all varietals, had small berries and reduced yields from either shatter or millerandage (hens and chicks). Smaller berries (especially in thin skinned Pinot Noir) simply cannot withstand intense heat and will begin to desiccate if left on the vine after physiological ripeness has occurred. Harvest began August 14th, the earliest pick-day for us at Radio-Coteau since we began in 2002. Grapes trickled in throughout August as temperatures fell and allowed for some additional time on the vine. Then 6 days of intense heat was forecasted, and all the remaining Pinot Noir came off the vine by Sept. 5th. We are committed to picking grapes before desiccation sets in from prolonged sun exposure. As non-interventionist winemakers, this is critical to preserve natural acidity, keep alcohol levels moderate, and retain freshness in all of our wines. The Syrah and Zinfandel typically ripens later and was able to hang out there for a few more weeks, though all of our fruit was off of the vine by October 5th. With grape yields down approximately 30% below average, the wines naturally have a gratifying density to them, and superb color extraction due to the high skin to juice ratio in tank. We utilized more delicate pump-overs in the fermenters this year to preserve elegance in this seductive vintage. Overall, the wines of 2015 are showing lots of vitality and distinction. Naturally balanced acidity is a common thread throughout the various lots, as well as fine-grained tannins. These elements should come together to create a classic age worthy vintage. Following one of the driest calendar years on record, the drought largely defined the 2014 winegrowing season. A dry winter, a mild mannered spring and a warm summer prompted the vines to nurture concentrated grapes, and ultimately led up to a very early harvest. After an unusually arid winter with intense frosts throughout December, February spring rains provided a bit of relief. Though we could have used more, this precipitation was enough to relax a little bit, while budbreak pushed a few weeks earlier than normal. Additional rain in early April fell just in time to soak into the surrounding countryside, bringing seasonal precipitation levels from very low to below average. Here in West County, a warm spring full of increasing sunlit hours paved the way for successful flowering and a healthy fruit set. In Anderson Valley a few Pinot Noir blocks experienced hard winter stress, ultimately resulting in reduced yields. The accelerated dry season growing conditions continued through most of the summer months. Several 3-day heat spells of 90+ degrees, and thus plenty of sunshine, were peppered throughout June and July. Signs of veraison were already visible by the middle of July. According to the Sonoma County Winegrowers weather tracking, the Growing Degree Days eventually surpassed those of 2013 (season-to-date) by the start of August. During the last few weeks of August we enjoyed two weeks of cool mornings with plenty of fog. These cooler weather patterns enabled even ripening and more hang time to develop deeper flavors. Harvest still came early. Harvest began August 23rd, five days earlier than 2013, with Pinot Noir from the Alberigi vineyard. Sections of Laguna and blocks of the Hallberg Ranch quickly followed. The fruit ripened early, and it ripened all at once. October began with a lengthly high-pressure system that brought temperatures well into the 90’s for 5 straight days. We made the call to bring in the rest of what was still hanging before any chance of desiccation could compromise fruit quality. All of our grapes (Pinot Noir, Chardonnay, Syrah, Riesling, Zinfandel) were in fermenters by the first week of October, and the fruit looked exceptional with clean, turgid, baby clusters. Following suit, 2014 is another solid vintage. The lack of available water seemed to have stressed the vines just enough to nurture a balanced crop load, and the wines from 2014 exhibit engaging density with strong aromatics and heightened vibrancy. The 2013 vintage was blessed with a grower–friendly farming season. Mild weather patterns with plenty of warmth resulted in quality fruit production, characterized by wines of balance and site specificity. A healthy dose of rain at the onset of winter quickly gave way to an early, warm and dry spring. Little did we know that we were amidst one of the driest calendar years on record. In April alone, temperatures reached 90 degrees F and accumulated approximately 300 Growing Degree Days. Few frosty nights, dry soil conditions and warm days resulted in an early bud break, though a beautiful fruit set. The vines welcomed the abundant sunshine and shoot growth was noticeable every day. We were already suckering at Timbervine in the last few days of April. The fast growing pace of spring never really slowed down. Though sans intense heat spells, the summer was filled with days where temps pushed into the 90s. The first signs of veraison occurred in early June at the Hallberg ranch, a few weeks ahead of schedule. Grateful that nature provided ample fruit in 2013, we were able to control yields early in the season. To ensuring our wines are site-driven and energetic, dropping green bunches prior to veraison is a critical step. Properly managing and executing the crop thinning is especially important in vintages like 2013. Throughout the growing season, mild weather patterns put little disease pressure on the grapes or vines. Eight days earlier than 2012, harvest began with the Hallberg vineyard on August 28th. Once picking began, harvest came fast and furious. Cellar space became a concern, and our musical tank shuffle allowed us to receive freshly drained wine in a timely fashion. A smattering of rain towards the end of September washed off the summer dust and put us back on our late–season varietal toes. But by then most of the Pinot Noir, and even some Syrah, was safely in their fermenters. Besides the brief rain, the temperate autumn days afforded us the opportunity to pick fruit at lower sugar levels and sound physiological ripeness. The wines from the 2013 vintage display bright aromatic intensity, seductive palate richness, and energetic balance. In 2012 Mother Nature gave us a relieving break from the dramatic 2010 and 2011 vintages, and we had near-idyllic growing conditions. Spring provided a healthy fruit set, a mellow summer allowed fruit extended hang-time, and a fairly dry fall kept mildew pressure at bay. These elements allowed us to strike that harmonious, yet often elusive, balance of keeping just enough fruit on the vine while maintaining richness, intensity, and verve. But let’s back up a bit. A drier than usual December and January eventually gave way to an intense storm just as spring was slowly emerging. March dropped nearly 8” of rain with more rains in early April. Budbreak was delayed slightly, just before a high-pressure system got comfortable over Sonoma County and pushed the vines out of dormancy, into the sunshine. The warmth and mild weather patterns continued and provided magnificent bloom conditions for a healthy fruit set. With the exception of dense fog-filled mornings and one triple digit heat wave in July, the mild weather patterns continued throughout the summer. The nights were unseasonably cool, in the low 40’s. Luckily, the vines experienced the wonderful 45-50 degree diurnal temperature variation. In this natural phenomenon, energy translocates from the roots up to the fruit and back to the roots again each day and night, building a foundation of delectable flavors and complexity. As the clusters developed, we began to notice higher crop estimations and took measures in the vineyard to the reduce fruit load. The vines could now concentrate their energy and even the ripening process. We are proud of our coastal cool climate vineyard terroir, yet we work with sites that are more susceptible to harsh weather patterns, which can be difficult for later ripening varietals such as Syrah and Zinfandel. However, the growing degree days of 2012 mirrored the classic 2009 vintage, and the grapes across the varietals remained on the vines long enough to develop complexity. Though a few heat spells could have potentially pushed sugars up, we preferred to pick for flavor and phenolic development as opposed to higher brix. Most of the pinot was brought in before these temperature spikes, and we are pleased with the results. With a few new vineyard sites in 2012 and an abundant year, we were filled to the proverbial cellar brim. We practiced our minimalist approach in the winery by ensuring healthy vines and impeccable fruit in the vineyards, before it even reaches the cellar door. A keen eye kept on the vines, and painstakingly maintaining balance throughout the year, has graced us with exceptional wines, each expressing the personality of its unique growing site. From a wine growing perspective, the 2011 vintage was one of the most nerve-racking in recent memory. Challenging conditions began in late winter and spring, posing issues for bloom and fruit set. A cool summer further delayed the onset of harvest, and rain in October and November turned our knuckles white. Mother Nature gave us a trying vintage and we had to make difficult decisions in vineyard and cellar, subsequently lowering production. Despite the odds the wines of 2011 are showing outstanding elegance, exuberance, and concentration. The beginning of 2011 started out cool and dry before the rains delivered a significant amount of water in late winter. More storms rolled through spring followed by a few late cold snaps that posed a threat at a few of our already cool climate sites. Western Sonoma County endured a wet and windy spring that hindered fruit set and reduced bunch weights, and ultimately crop load, but also assisted in growing luxuriously small berries with deep flavor and lovely aromatics. June came and went, July followed, and then August was here. But where was summer? The fact is the summer of 2011 consisted of many foggy mornings with unseasonably low temperatures. But what a wonderfully long and gracious summer it was. The mild temperatures extended grape hang-time and developed intricate flavors in the fruit, thus teasing out an elaborate spectrum of complexity in the wine. The mild summer gave way to a soothing heat spell the second week of September, which reinvigorated our spirit and pushed sugar levels up in the grapes. It was just what we needed to kick start the 2011 crush. Later than usual, harvest began on September 12 with select sections of the Pinot Noir from the Hallberg vineyard. September continued with a smattering of very warm days that allowed the Pinot Noir to come in at optimum maturity and impeccably clean. Rains in October became increasing realistic and the frenzy climaxed to a nail biting harvest as we picked the Syrah from the beautiful Timbervine vineyard at daybreak, October 3rd, minutes before the rain began to fall. We brought in the remaining clusters just ahead of another storm front in early November. The fruit came in with lighter bunch weights, smaller berries, lower sugar levels, fresh acidity and beautifully nuanced. No doubt 2011 was a challenging vintage as Mother Nature tried our patience and perseverance. Yet tasting through the wines, they elicit energy, grace, and a focused elegance. We feel the path was, and continues to be, navigated with wine quality as our priority. With the ground charged with an El Nino driven winter, ample water supply, and gradually climbing springtime temperatures, the overall growing season leading up to the 2010 harvest was intensely promising. As we marched toward go-time, the reality of 2010 being an unseasonably cool year was realized, with dramatic excitement pursuing each step. During bloom in select viticulture areas, inconsistent day and night time temperatures posed fruit-set challenges, resulting in low yields. August started out unseasonably cool with day time temperatures hovering around low 70s. Then, by the third week a 100F degree heat spike gave any exposed fruit sunburn. Any exposed fruit was dropped. Lower yields. September 10th kicked off the first pick of the season for Radio-Coteau. Cooler weather intertwined with a few heat waves allowed for full flavor development at lower sugars, paving the way for bright acidity, balanced tannin, deep color, and lower alcohol in the finished wines. As the latter part of the season approached, winegrowers patiently waited for summer to arrive. The month of October along the Sonoma coast posed a different story for some later ripening varietals. The beginning of the month started out with cooler temps, followed by intermittent weather patterns. The site location and microclimate determined the harvesting fate for most coastal sites in 2010. This years harvest yielded cooler conditions, of which the Northern Californian region has not seen in quite some time. And, while challenging, the vintage will produce some very exciting and vibrant wines. Although drought conditions persisted throughout many of the north coast appellations towards the end of 2008, rainstorms began in January of ‘09, and with it a great sigh of relief. February followed suit with heavy storms, high winds, and bountiful rainfall. March began wet, but by mid-month the sun’s warmth initiated budbreak for north coast vineyard sites, many in Sonoma Coast, Russian River, and Anderson Valley. True to form, late March yielded cooler temperatures, setting off frost alarms and dusting higher elevations with snow. April was similar, exhibiting both warm and cool temperatures, typical behavior of these moody spring months. Vine growth was healthy during the month of May, and the Petaluma wind gap delivered persistent early evening fog, blanketing many of our coastal sites well into the late morning. June started calm, and towards the end of the month temperatures meandered in balanced cadence of modest highs and lows. The vines welcomed the weather, flourishing with the sun and resting with the mild balminess. A generally cooler yet consistent July came and went with little extremes in heat or cold, and the plants maintained their vigor and growth. August brought consistently warm temperatures and perfect ripening weather for earlier coastal varietals. Spanish for fog, La Neblina rolled in daily, cooling and maintaining balance and fruit integrity. By the end of August, the climate had provided enough balanced heat to ripen the fruit in a healthy manner, and we harvested our first 2009 grapes on August 29th. September provided more heat to ripen most of our sites. The harvested fruit had exceeded expectations. Radio-Coteau focuses on cool-climate vineyard sites that can produce great wine, yet can also succumb to the vagaries of nature. Our season came to a soggy close when the El Nino driven weather pattern started the first storm of the year in mid-October, and the skies dropped over 6 inches of rain. Even with heavy winter storms throughout January and into February, rainfall accumulation for the 2008 season was below average, and drought conditions persisted throughout many of the north coast appella-tions. A dry and sunny March allowed bud break to occur on schedule in mid-March under clear skies. Though daytime temperatures were moderate, clear nights brought low temperatures into the freezing zone at the end of March and into mid-April. Vineyard sites at both lower and higher elevations experienced these very cold nights. Multiple frost events occurred and tender new growth was damaged, while further impacting bud fruitfulness and the overall yield potential for the coming season. Following the cold snaps, warmer, more temperature weather arrived in late spring and early summer. There were several days in mid-April that reached record breaking highs, drying much of the topsoil and ground cover. Cooler temps returned in the middle of June during bloom, resulting in shatter, thus further reducing crop load across many coastal sites. Late June brought wildfires throughout areas in northern California, clouding the skies with smoke. July temperatures were more moderate in the high 80’s, and many warmer days returned in August. The month continued on a warming trend, and harvest began on the same schedule as 2007, on August 31st. Weather finally cooled near the end of the second week of September, with cool foggy evenings. Typical foggy nights and mornings persisted, and temperatures barely rose into the high 70’s during this period. A brief rain event occurred in mid-September, and a light storm followed during the first week of October. The storm was fairly insignificant, and had little effect on hanging fruit, because sunshine returned shortly thereafter. Cool nights and warm days continued to ripen grapes slowly. Grapes were harvested under cool but sunny skies, having achieved full ripeness. The season closed with a glorious Indian Summer yielding great potential for cooler sites and late season varietals. Few years in the last ten have been as unpredictable or as unexpectedly successful as the 2007 vintage. Unusually warm weather in March hurried vines to early budbreak with the exception of Pinot Noir, which may have been pushed deeper into dormancy by a particularly hard freeze in the latter part of February. All varietals broke on or near St. Patrick ‘s Day into brilliant spring sunshine. The weather cooled in April and remained chilly in May, slowing shoot growth. Lower than normal temperatures throughout May and into early June caused shatter and excessive lateral growth. Weather warmed in late June and into July, and two minor rain events in July contributed to a late flush of vigor, pushing vine growth through veraison and into the fruit-ripening cycle. August mornings were clear and nights were unusually warm. This, combined with hot and arid temperatures through the latter part of August, ripened most Pinot vineyards by the first week of September. Despite the heat, the grapes came in looking clean and tasting fresh. After the first week of September, temperatures cooled and the morning fog returned, lowering water stress and raising botrytis pressure. Despite dire predictions, three weather events passed over Western Sonoma County during the latter part of September without incident. All Chardonnay, Syrah and Zinfandel grapes were picked in this cool, marginal period before the fall’s first major storm arrived on Friday, October 12th. This “La Nina” year, marked by cooler latesummer temperatures and earlier than normal precipitation, delivered fruit with clarity and precision. This allowed terroir driven flavors a chance to shine, leading to perhaps the most site expressive collection of wines bottled to date. The 2006 vintage started late, as had the year before, but once the vines got started they took off like a shot. Due to late rains, excess available moisture in the soil led to vigorous canopy development continuing into the summer, with warm weather further enabling growth. The weather cooled somewhat after veraison, and the heat spikes that usually arrive in early September never showed. A period of heavy morning fog and high humidity led to outbreaks of botrytis by mid-September throughout the North Coast. Our growers worked hard to combat the infection, clearing leaves and dropping fruit on multiple passes. As a result, the Chardonnay and Pinot Noir were picked cleanly with good phenological ripeness under cool, overcast skies. Finally, in late October, the weather cleared and turned warm again, just in time to finish off the Zinfandel and Syrah. In fact, 2006 may prove to be the perfect season for cool-climate Syrah, which benefited from what some would call a “continental” climate pattern. Most of the heat arrived mid-season, ahead of schedule, and the weather turned moderate late, which is more common in continental climes. This pattern enhanced aromatics in the Syrahs and plumped up mid-palate textures significantly. Most of our wines, in fact, are more approachable in their youth than the 2005s, with a riper core of fruit and a less overtly structured palate. 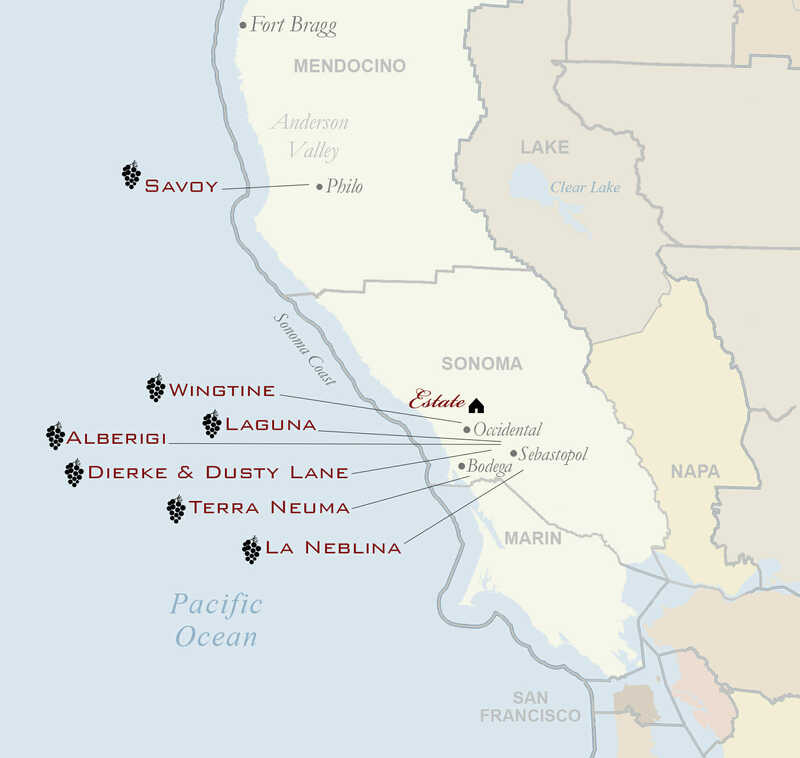 The 2005 vintage began with a cool, wet spring that delayed budbreak on the North Coast, and severely limited fruit set in some coastal vineyards. Rain continued sporadically through June, which charged the soil with moisture, often resulting in vigorous canopy growth. Eventually the rain passed and the California sun returned, providing optimal ripening conditions through the beginning of November, when our last parcels were picked. Compared to recent years, this vintage was markedly cooler overall, with few heat spikes and mostly moderate temperatures throughout. The lack of extremes during the ripening period helped the fruit retain its fresh flavors and bright acidity, while allowing the tannins to develop gradually, contributing to a sense of harmony and balance in the finished wines.